Ah, summertime is here and the living should be easy. Who wants to fuss around slaving over a hot stove when the weather is warm and gorgeous sunshine is calling your name? I know that after the long winter days with almost no sunshine here in Alaska, we grab almost every opportunity to head outdoors when the summer weather is cooperating. I’ve found that sitting around a table, or the campfire, as a family is when we often bond together. We share about our day or the boys joke around some. It’s those little things that form the bonds and memories for years to come. And, of course, there’s the food which truly cements it all. After a short stretch of rain, we are headed into some unseasonably warm, sunny days here in Alaska. That means I want to have meals the appeal to the family while not heating up the kitchen. Plus, I want them to be easy to prepare. 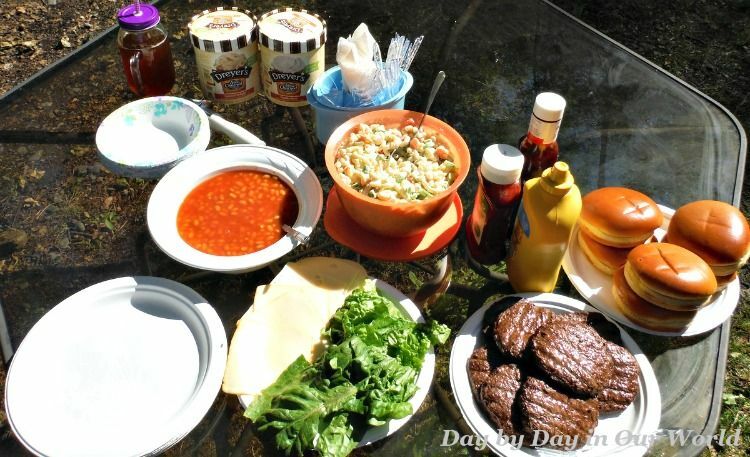 One favorite summertime meals for my family consists of grilling burgers to serve with side dishes that pair well. During the winter months, burgers are often paired with fries. For summer, I like to have beans alongside either a macaroni or potato salad. A few of the boys are not real fans of potato salad. For this particular meal, I elected to make some homemade macaroni salad. Canned baked beans were the boys pick for a second side dish, although I sometimes take the time to make our favorite crock pot bean mix. While I am not adverse to store bought items to save time, I have found that some things are just better made at home. Macaroni Salad is one of those dishes where everyone in the house will eat the homemade while only a few eat the store bought one. The secret for my homemade veggie rich macaroni salad is to whip up a cup or so of ranch dressing. This is the first thing I do using dry ranch dressing mix cut into equal parts of milk and mayonnaise. Then it goes into the fridge to chill and set. Next is making the macaroni. I used a pound of dry pasta. I wanted to have plenty to feed the family and still have some leftovers for upcoming lunches. Once it is cooked, I drain and rinse it well with cold water. The best thing to do is then place it into the refrigerator to cool down as well. 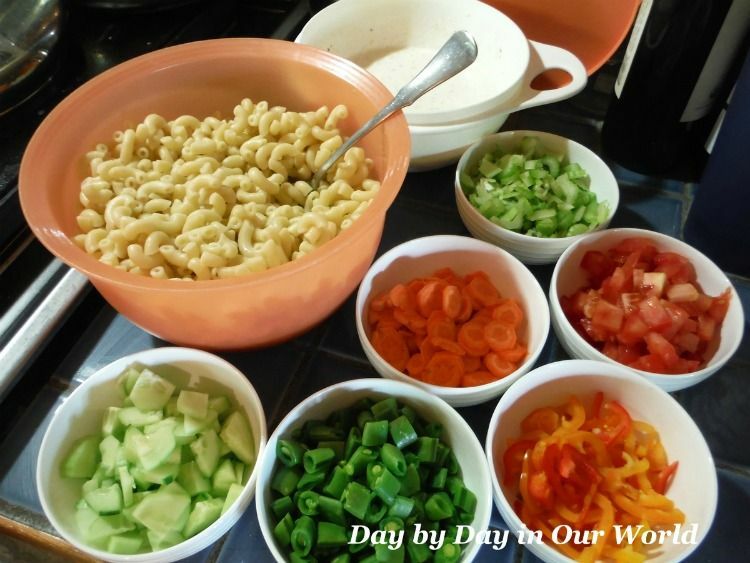 The final preparation before the mixing of the macaroni salad is to gather and chop into small pieces all the vegetables you have on hand and want to use. I cut more than I thought I would need and had each item in a separate bowl before adding to the pasta and dressing. I figured any leftover veggie bits could be saved for my salad the next day. Tomatoes are the only thing I chopped, but did not add directly to the macaroni salad as they tend to be quite wet. 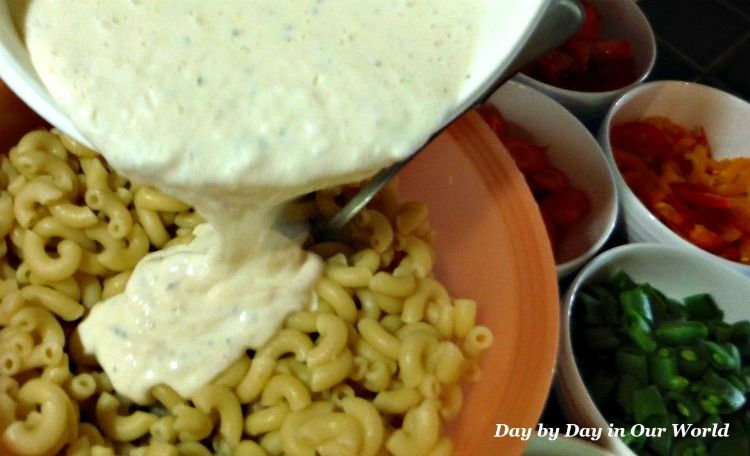 Before mixing ingredients together, make sure the ranch dressing and elbow macaroni are cold. Toss the elbow macaroni with 1 cup or so of ranch dressing. Use more if desired. Add diced vegetables to the pasta and toss to coat. Either chill in the refrigerator or serve and enjoy. I would definitely consider adding bacon bits to this as it would go nicely. And, to end a casual summertime meal, there’s no better option than a bowl of ice cream. We go through a lot of ice cream in our house, regardless of the time of year. I’ve heard Alaskans eat more per capita than any other state in the United States, but I haven’t confirmed that fact. I do know that my family enjoys it year round, though. Thankfully, our local Walmart keeps a large supply of DREYER’S Ice Cream in the freezer section with a lot of options for flavor. 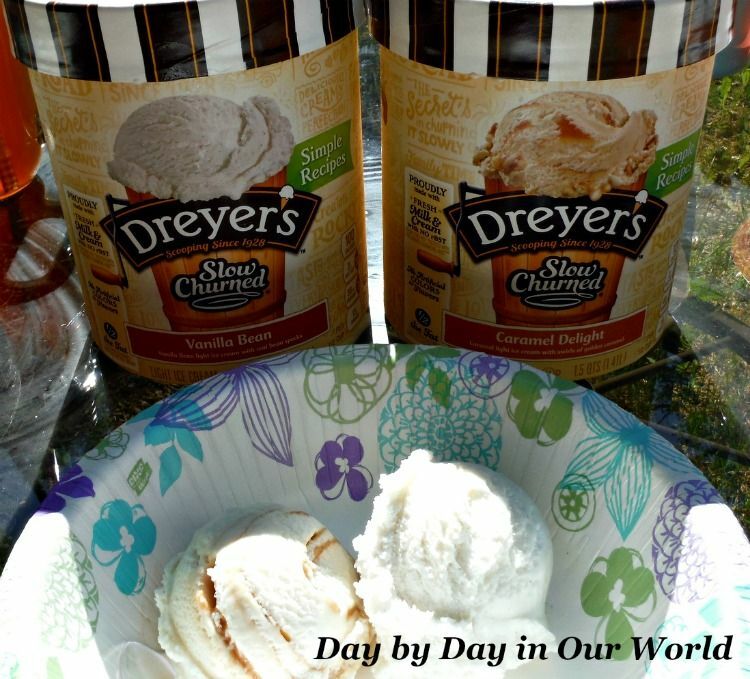 On a recent trip, I picked up both the DREYER’S SLOW CHURNED® Caramel Delight Light Ice Cream and DREYER’S SLOW CHURNED® Vanilla Light Ice Cream. These ice creams are “simply made, simply delicious” using fresh milk & cream with no rBS, no artificial colors or flavors, and no GMO ingredients. Plus, they taste great! 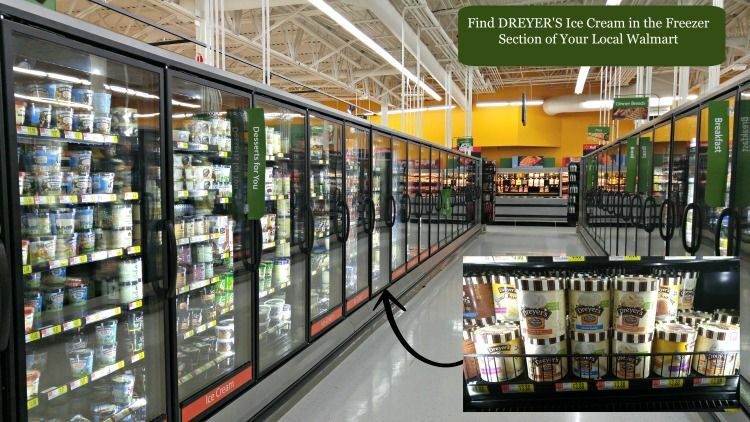 Check out this demo list to see if you can sample some of these great flavors of DREYER’S Ice Cream at your local Walmart at the end of this month. A scoop of each flavor was how we ended our recent dinner and it really paired nicely with everything we ate. What are some ways that your family bonds for meals? Are backyard barbecues something that your family enjoys doing? How would you celebrate togetherness with DREYER’S Ice Cream? 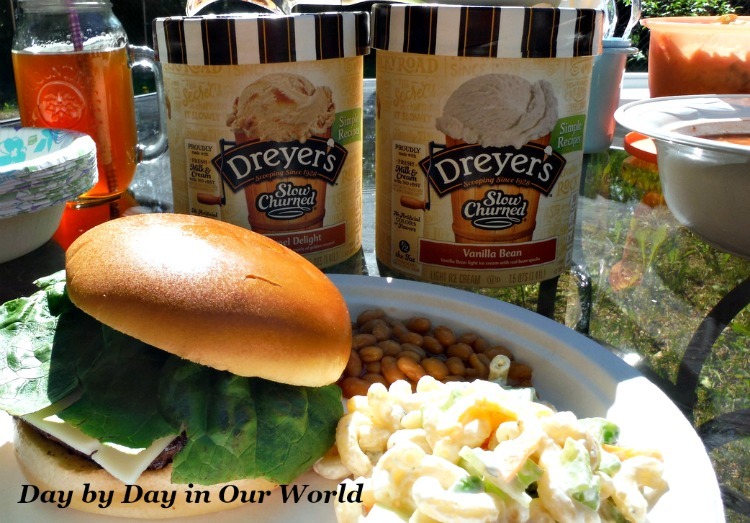 I love serving cold salads like this macaroni salad with hamburgers during the summer. 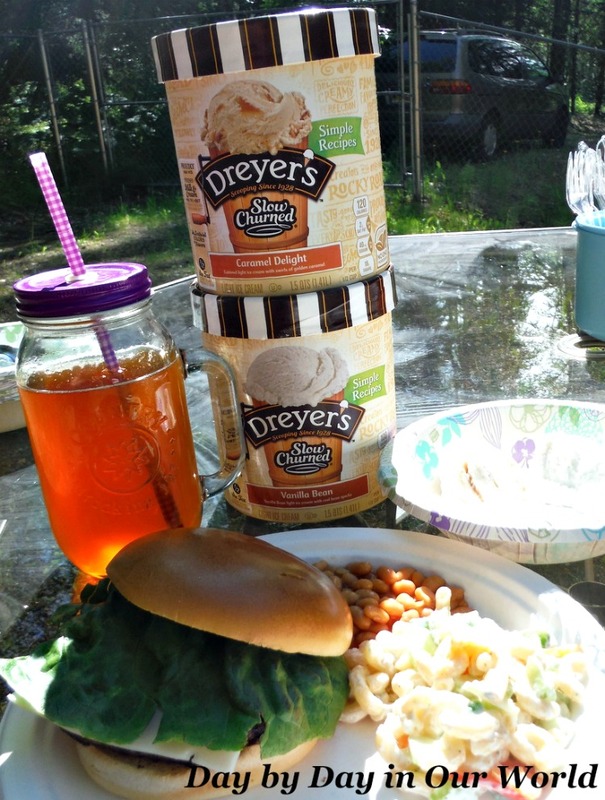 Finishing the meal off with ice cream makes it the perfect cookout. I'm all about macaroni salad during the warm months of the year. It is quick and easy an won't have me in the kitchen for hours. I've not heard of Dryer's but it sounds like my favorite brand of Bryer's but looks like Edy's. I wonder if we have that here in DC. Either way I'm all for ice cream any time of day works for me. I love the idea of a veggie-rich macaroni salad. This is something I'd love to try with my family and our upcoming BBQ gatherings! 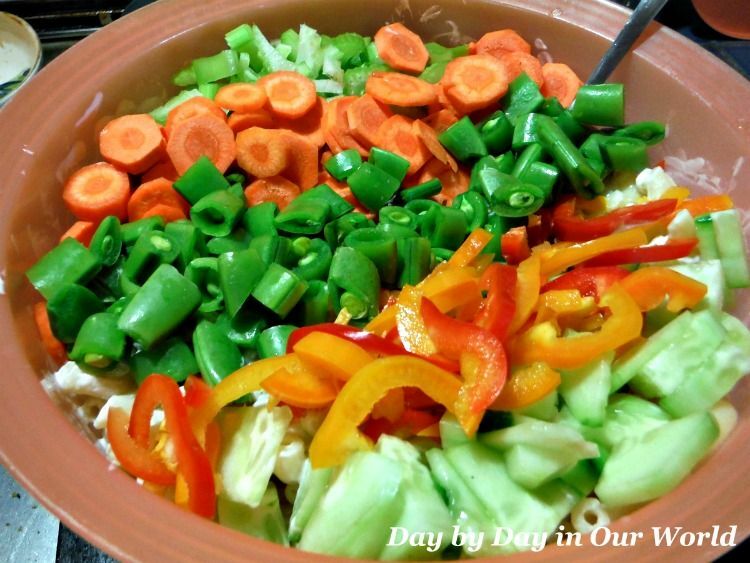 This sounds like a great way to get extra veggies in the kids, too! What a spread. Looks like a BBQ I want to be invited to. 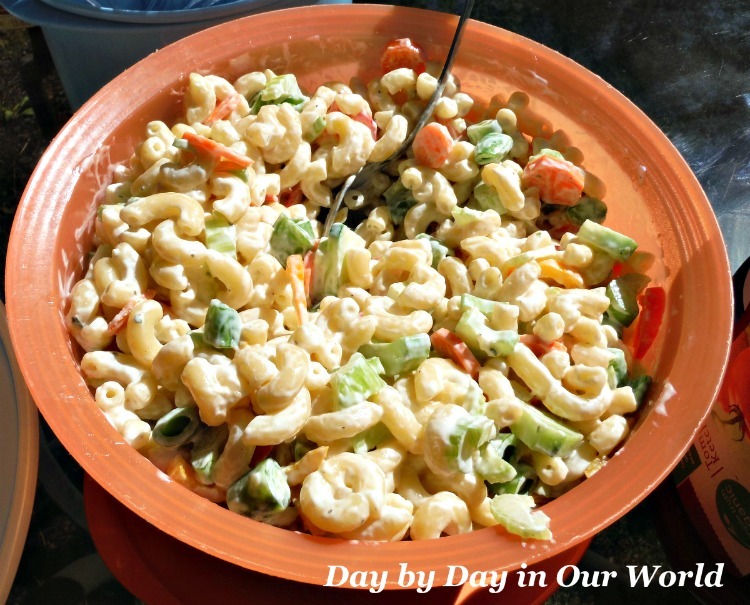 That macaroni salad is right up my alley, love lots of veggies in my pasta salad. And finishing off with ice cream is a great idea. This looks delicious and would be great for me to even have with my special diet! Looks like a great salad, and one my kids would need convincing to try either! Now this sounds like a great summer recipe. I need to try it! I love all of the veggies. I love veggies in my pasta salad so so good! We love ice cream in this household is a must during Summer to have. I am in love with macaroni salads! I will make this! I love a good macaroni salad but have never made my own before!! This looks so easy!! Great recipe!! Oh I love macaroni salad, it's been awhile since I had some. I'll have to make some using your recipe. This veggie rich macaroni salad my boys would indeed love to try so I will have to make it for them. We just finished of the Dreyer's Caramel Delight Ice Cream which is delicious and great for a family fun night. Thanks for sharing the recipe. Pasta salad is one of my favorites! Pair it with ice cream and you have a really big winner here for me. Mmm I love macaroni salad! That all looks really good. I can't wait to make it on our next barbecue. I love macaroni salad especially during the summer, it's the perfect side to any barbecue! This one's pretty loaded and I love that you added a lot of veggies. I agree with the tomatoes making the salad too wet, it would be nicer to just serve it on the side. Holy smoly, that macaroni salad looks as good as that ice cream does. I need to make it this week to serve with hamburgers and a milkshake made from that ice cream. I haven't used my grill yet this summer. I keep thinking about grilling some pork ribs but always end up doing it in the oven. Oh now, that looks so good! The only reason I love summer is because of the BBQ's. I love me a good BBQ with good side dishes! You are welcome, Elena. My boys really enjoyed it and we're tweaking the recipe a bit still.